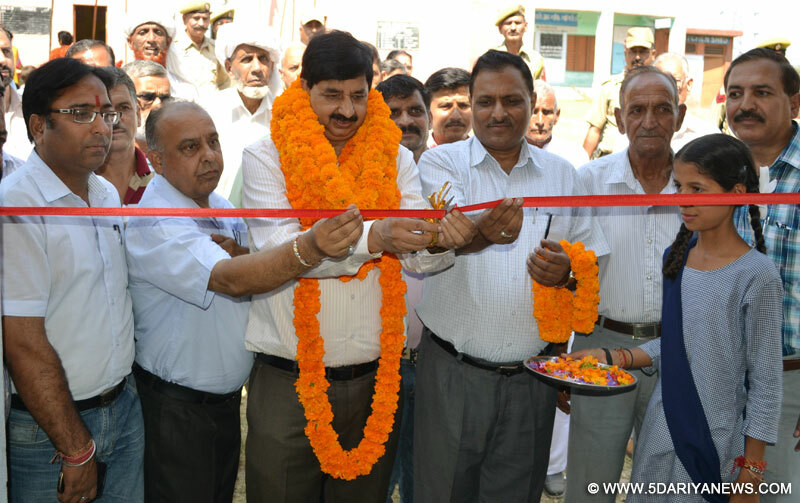 Minister of State for Finance and Information Technology, Mr. Pawan Kumar Gupta today inaugurated newly constructed additional block at Government Girls Middle School Kharodian, Battal Ballian Udhampur. The additional block constructed at a cost of Rs. 2.35 Lakh under SSA will house Head Teacher and Store Room.Chief Education Officer, Mr. Bishan Singh, Principal, Mr. Rajesh Sharma, Sarpanch, Panches and people of the area present on the occasion. The Minister complimented the people of the area and underscored the importance of development of infrastructure under SSA in schools for creating better teaching -learning environment. He appealed the people of the area to send their wards to Government schools to avail the services of highly qualified teachers available in these institutions .The people of the areas also projected their problems and demands, which mainly included construction of playground, repair of boundary wall of the school, upgradation of school to high School, repair of road, regular power & water supply, installation of hand pumps etc.Gupta assured the people of the area that every possible step would be taken for the fulfillment of their demands as soon as possible. Mr. Gupta further added that soon hand pumps will be installed in their area to overcome the shortage of water supply.